This week I can mostly let the artwork speak for itself… but only mostly! * Starting tomorrow, I’ll tweet at least one face each week plus a line of dialogue that goes with it. And I’ll call it Talky Time Tuesday! :D Since this site is a more comprehensive collection of Dreamblazers-related material than Twitter, I’ll also add a new Dialogue page here that will embed all those tweets. * A small Easter egg here is Leaf’s nail polish. Leaf’s a pretty mysterious girl; her magical-musical skirt plays tunes according to her will, but her nail polish made from a liquid rainbow changed colors randomly until she experimented with chemical catalysts to control it. Blue and green are her usual colors! * While this is the full collection of expressions made so far, the number of expressions per character is subject to go up; for example, I might see a face for a later character and then realize that Leaf should have the same kind of face and doesn’t. Right now Besarre is the most likely to get one or two extra expressions. Possibly my inspiration for the original Ardis? We did try darker skin for her during the design process, but my knowing that her name was Irish led me to stick with lighter skin. And while Ardis is technically still a half-elf, she’s now also a half-sylph, fitting in with Irish lore. 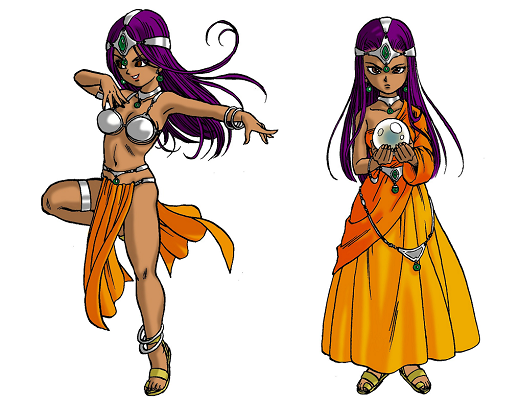 She was one of my least developed characters back then, basically a glorified set of stats who filled a party slot and faded out of existence at the end of the game (because for some reason all the great RPGs on the SNES had people fading out of existence at the end of the game), but the modern personality I’ve come up with for her has made her one of my top five favorites to write for now. * Random trivia time about Besarre! Like Ardis, I thought I was making up a name in 2000-2001, but it wasn’t Besarre at the time; he was named Bestiary and wouldn’t you know that’s a real word. He was also underdeveloped just like Ardis and even more than her, but his importance jumped massively in 2012 when I was penciling out the rough progression of the plot and figuring out how to tie different story elements together. * Random trivia time about Leaf! Yet another tale of 2000-2001: Leaf was the name of a talking orange cat who was one of the 17 main characters instead of a girl who happens to carry a kittyara with her. But fear not! The talking cat is still in the story with a different name, color, and gender—and she’s coming soon! More faces will be posted here as progress continues. =) And the trivia will roll in with them! 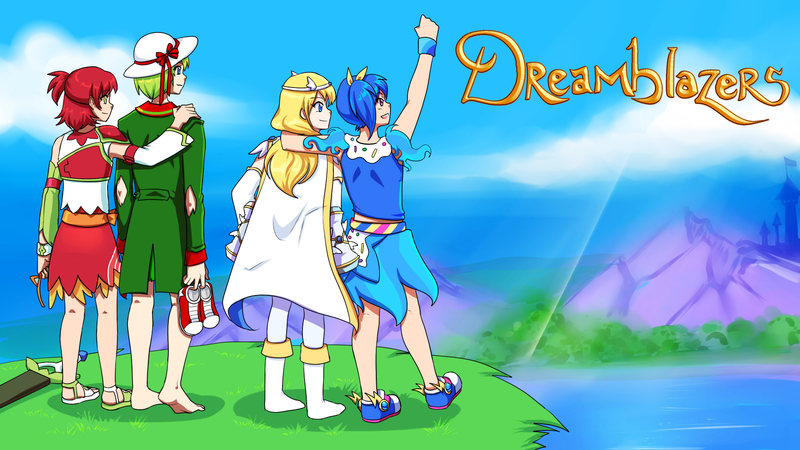 This entry was posted in Devlogs, Dreamblazers, Dreamblazers Trivia, Video Game Art and tagged Bravely Default, Dragon Quest, Fire Emblem, Tales of Graces on February 23, 2015 by JellyPaladin. Sometimes things come full circle. Sometimes they even do it three times in one week! Status effect types – This finally brings organization to the chaotic mess of 400+ effects that I created for my fashion system and lets me do things like “Neutralize” magic that removes all “Stat Boost” type effects. That second part was an important component that I had wanted from the beginning, but I’ve been living without it for so long that I actually forgot it wasn’t possible yet. It’s a key part of Celty’s abilities and her character: because she reads people well and sees the truth about them, so to speak, she can easily undo any enchantments. So faces are soon to get underway as I’ve been gathering references, thinking out which characters will react in which ways, and so on. 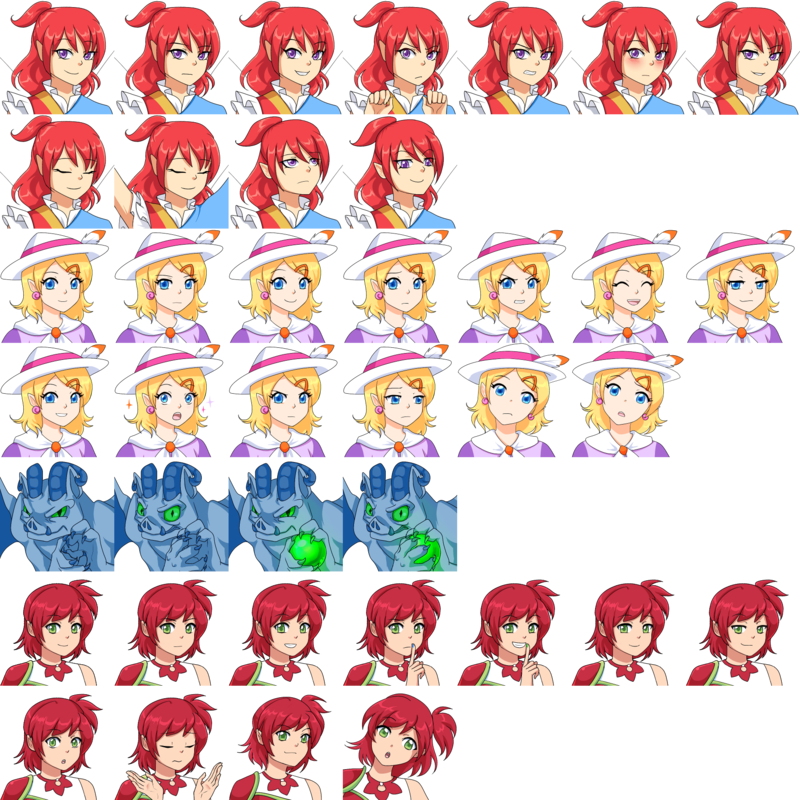 Since I have so many characters I’m trying to be careful about not going for 23935 faces to cover every possible scenario, but only the ones that I truly need: some characters never get Angry faces, others never get Scared faces, and so on. It’s trickier than it might sound; having over 30 characters and about 30 expressions that I can think of is a lot of combinations to sift through and this also needs to be balanced against the two main currencies of life: money and time. This entry was posted in All Text, Devlogs, Dreamblazers on February 16, 2015 by JellyPaladin. True story: when I took the SAT—the big important high school test here in the US that determines one’s college-worthiness—I didn’t read the instructions, so I didn’t know that answering wrongly deducted points while leaving a question blank didn’t. I still scored 760/800 on the writing section, but I took what I’m assuming was a substantial hit in the math section, where I distinctly remember filling in random numbers to a few questions that were beyond my level. I got 620/800, so according to the scoring system used in my time my overall score still landed upwards of the 93 percentile. Here in the indie game development world, however, reading the instructions is apparently compulsory! Now that I’ve finally listened to what some might consider common sense and looked more deeply into ORK tutorials, I’ve gotten my scene transitions going (i.e. stepping onto an overworld cave to leave the overworld and appear in the cave) and I’m decently underway with dialogue. The ORK directions are aimed at 3D games, so I do have to adjust as I go, but the sense of progress is palpable. =) After these things comes the undertaking of translating the battle system into 2D—much more interesting to me than dialogue and slightly more interesting to me than exploration, to be sure, but everything has a proper order to it. This entry was posted in All Text, Devlogs, Dreamblazers on February 9, 2015 by JellyPaladin.